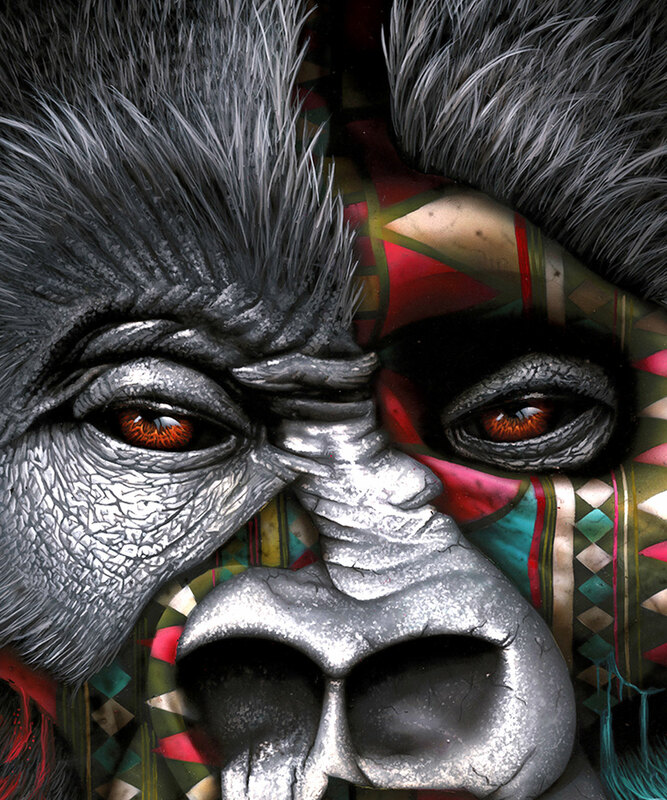 Johannesburg-based, British-born street artist Sonny has established a name for himself with his evocative, hyperrealist spray-painted murals that combine an exotic iconography inspired by the wildlife of his adopted country and an intricate colour palette of hundreds of hues. 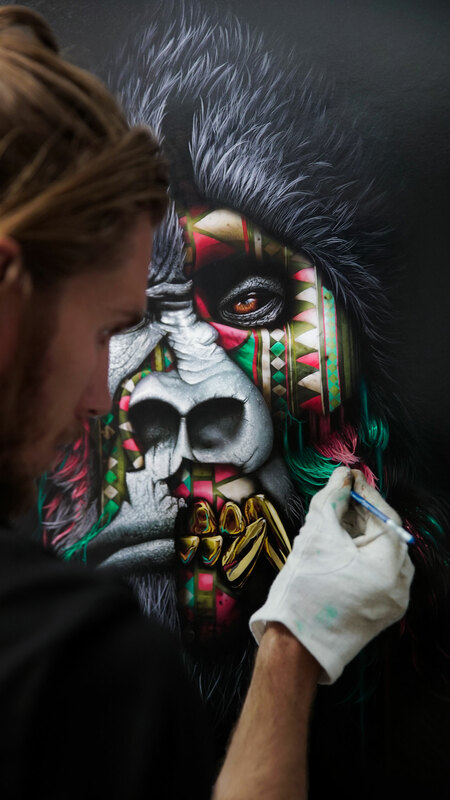 For his new multi-disciplinary project “To The Bone”, Sonny temporarily abandoned the streets for his studio to create a series of hand-painted canvases of extraordinary detailing that will be unveiled on May 17th, 2018, in New York. 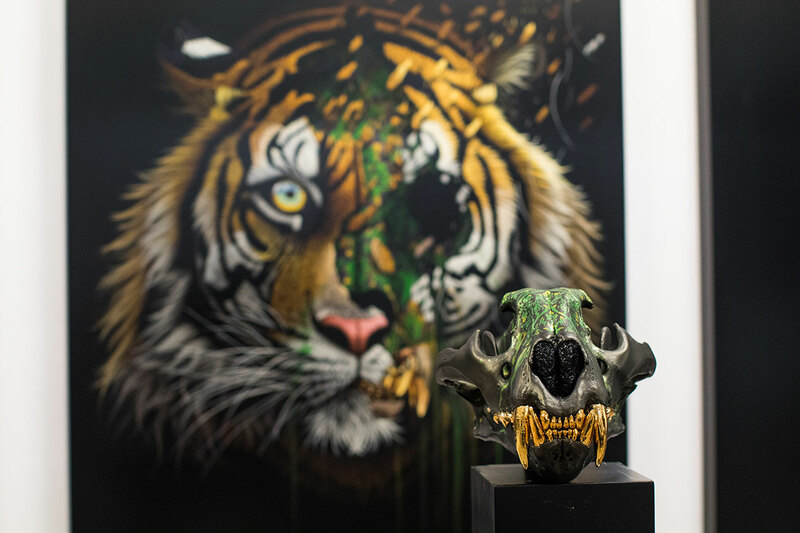 Fueled by his passion for animal conservation, the project aims to raise awareness as well as funds for the world’s endangered wildlife species. 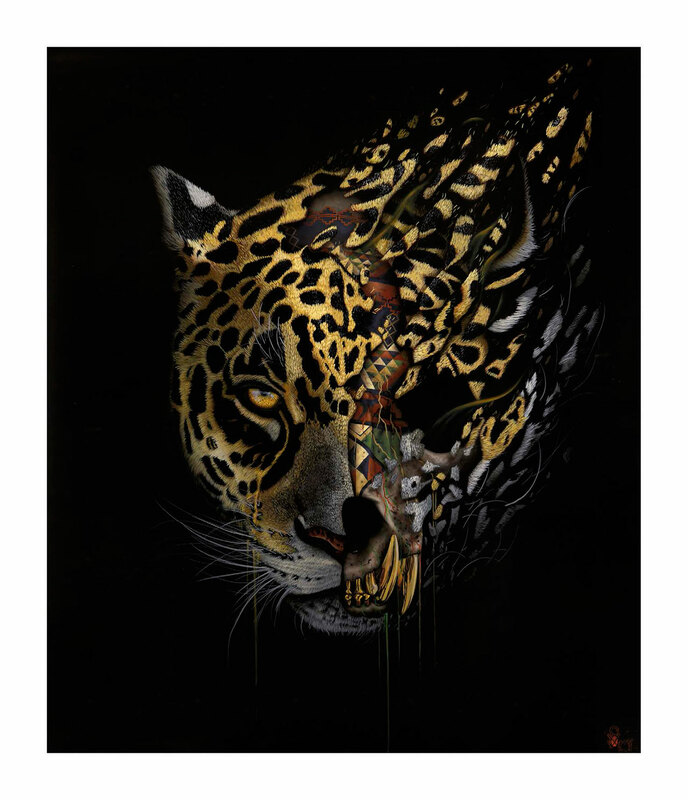 Tiptoeing between reality and fantasy, the animal portraits in Sonny’s paintings are painstakingly rendered in great detail, with part of their flesh stripped down to the bone to reveal colourful patterns inspired by tribal art from the animal’s natural habitat. 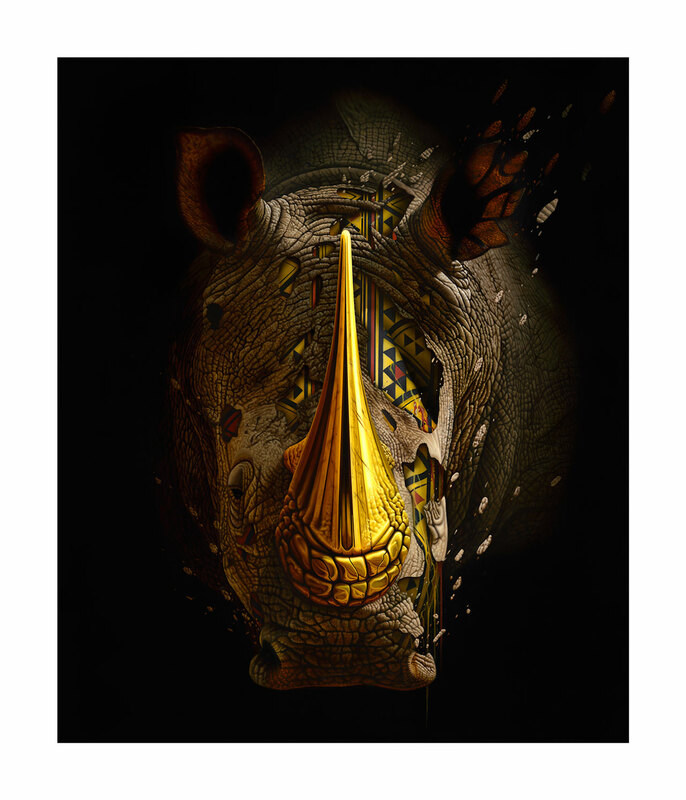 Depicted with golden horns and teeth that allude to the reason they are targeted by poachers, their haunting faces allow viewers to look directly into their eyes and fathom their dire predicament. 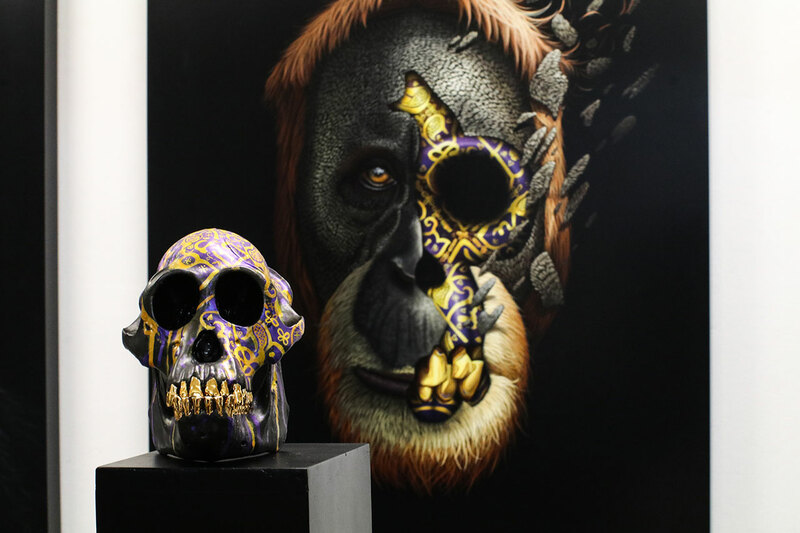 The exhibition, which will also feature hand-painted animal skull replicas, symbols of both the precarious future they face and their inherent might, is the culmination of an ongoing worldwide tour that has Sonny creating large mural paintings from the streets of Amsterdam, Miami and London, to those of Vladivostok in Russia. 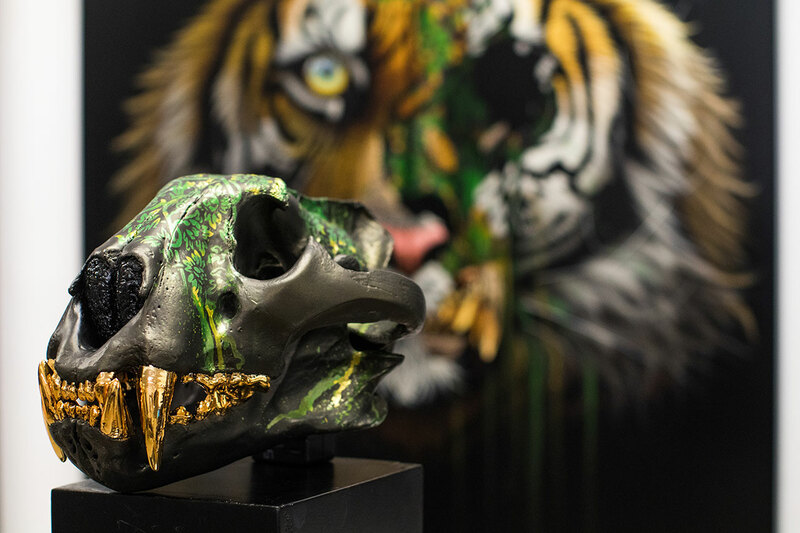 Sonny talked to Yatzer about his ambitious project, his artistic practice and his fascination with wildlife. What inspired you to become an artist? Did you draw or paint as you were growing up? What drew you to street art in particular? While I did sketch a lot when I was young, I didn’t take it too seriously. I didn't paint though, just pencil. I never saw myself as an artist really, it was just something I could do and enjoyed. I never had any formal training and didn’t even take art as a subject in high school. When I was around 23 years old, my friends and I were setting up a band room and I decided to paint all the walls and ceiling with a giant mural to cover a drunken graffiti session from the night before. I didn’t have the slightest clue how paint at all - spray or brush - but I could visualize it at the time and so I just taught myself the methods I needed to create it and got pretty obsessed. From then on, I’ve continued to paint the ideas and visual stuff from my imagination, learning whatever techniques I need to achieve it. How did your fascination with wild animals come about? How did it relate to your artistic stirrings? 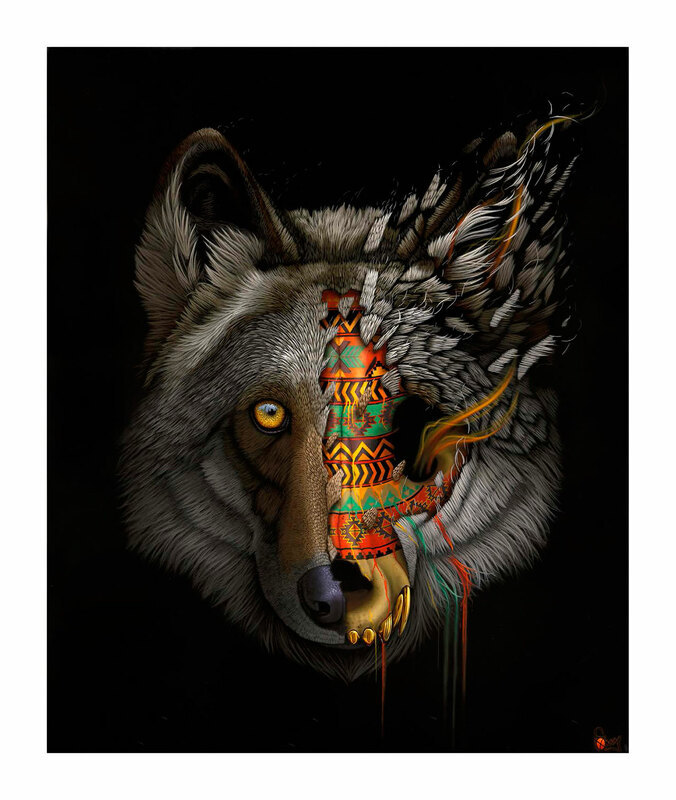 Did you initially incorporate such animal iconography into your art because of its beauty and exoticism or was it fueled by your ecological sensibilities? Living in South Africa was the start of the fascination for sure. I moved over from the UK at a young age and became totally mesmerized by animals. Even as a kid, I remember always having the utmost respect for them, viewing them as these majestic and godly creatures. I spent a lot of time in the bush growing up and the fascination never really wore off. The feeling you get in the bush is indescribable. Wild animals are amazing and each one is so different and perfect in their own way that you can’t possibly get bored. So, when I started painting, they naturally became my subjects of choice and I immediately started trying to capture their unique beauty through my art. Sonny, PINDA, original hand-painted canvas, spray paint and acrylics on handmade wooden boxes, 120 x 100cm. Sonny, ZOUYU, original hand-painted canvas, spray paint and acrylics on handmade wooden boxes, 120 x 100cm. How did the TO THE BONE project come about? What prompted you to initiate such an intricate multi-city, inter-disciplinary initiative? 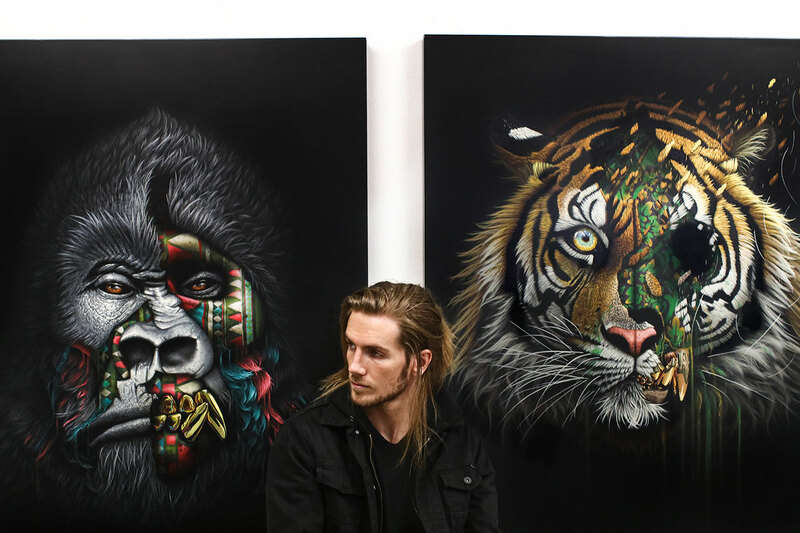 I suppose it started because I wanted to challenge myself by creating my first body of canvas work and my fascination with wildlife meant that animals were always going to be at the center of it. At the time, I had a lot of frustration around the state of our wildlife and not being able to do much about it. 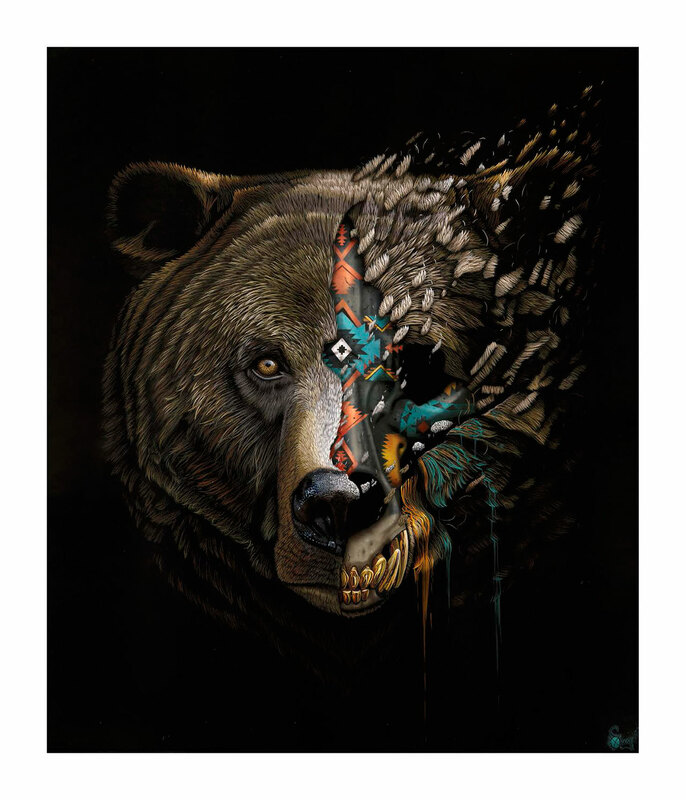 So, when I started working on the series and conceptualizing my paintings, I immediately wanted to incorporate a message around the importance of wildlife conservation. From painting on the streets I’d seen firsthand the impact that public art can have on a community and the reach that it has online. So, it was a natural progression to use that power to help raise awareness too. From there, everything kind of snowballed. Why did you choose to paint canvases for this project? 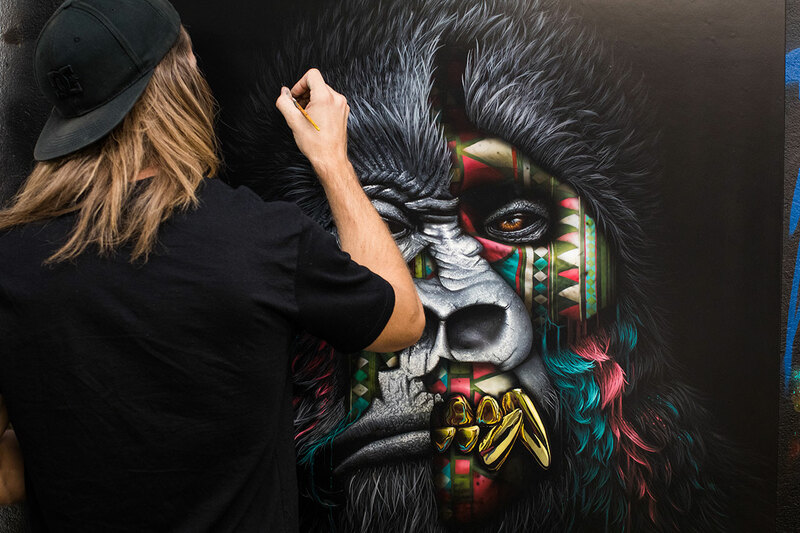 Do you artistically approach a canvas differently in comparison to a street mural? How does the difference in size affect the compositions you chose? The canvases were actually what sparked the mural tour and project, not the other way around. 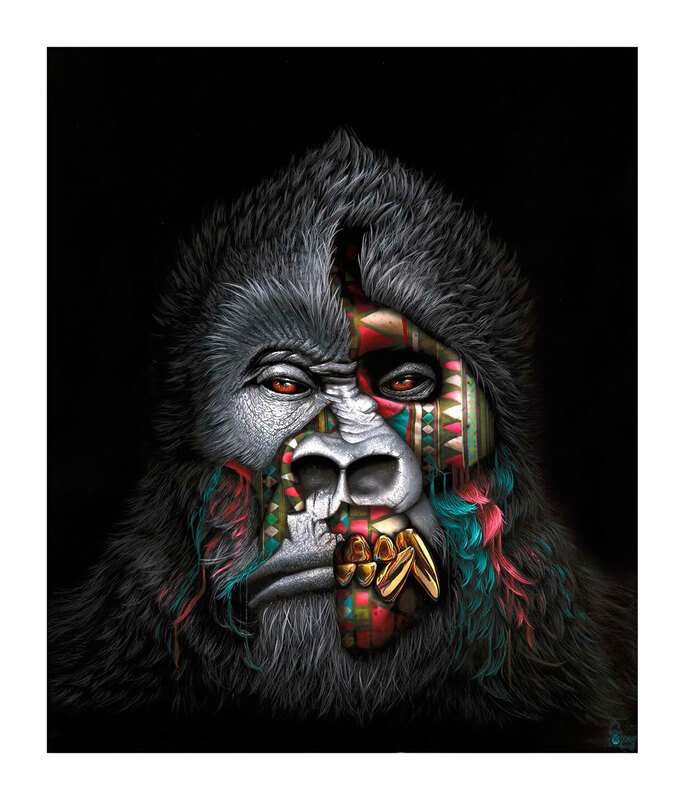 Doing canvas work was a new challenge for me at the time and I wanted another creative outlet beyond my street art. But the paintings proved to be far trickier than I could have imagined. I don't think size changes my composition too much, although when it comes to murals you often have to work around your environment and always paint with the community in mind so that the art is adding to the space. Sonny, KUMBUKANI, original hand-painted canvas, spray paint and acrylics on handmade wooden boxes, 120 x 100cm. Sonny, KUNGA, original hand-painted canvas, spray paint and acrylics on handmade wooden boxes, 120 x 100cm. 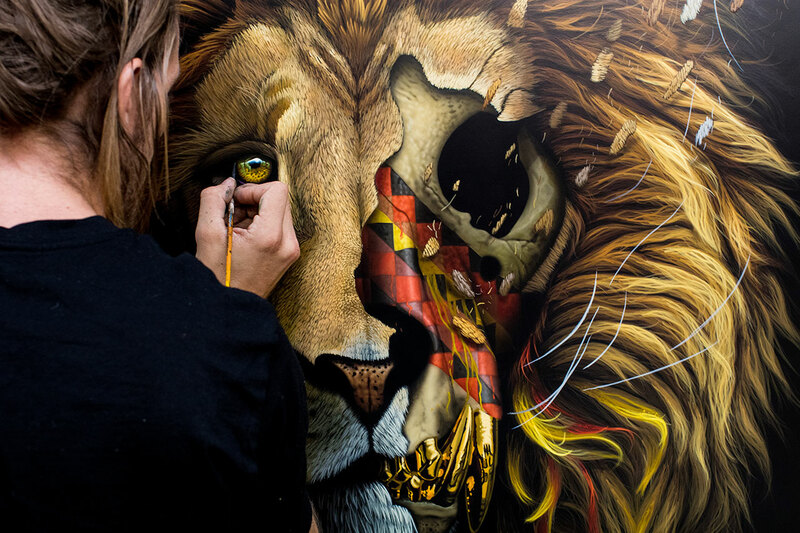 The detailing of your paintings is extraordinary. How intensive and time-consuming was the painting of each canvas? The paintings took a long time. I can paint a 4-story mural in 5 or 6 days, but just one canvas took weeks and sometimes months to complete. It made no sense to me initially and I was totally taken aback by it. When I started out with my ten paintings in mind, I gave myself a time frame of 3 months in the studio, but eventually spent well over a year working on the series! I taught myself so much about painting and colour during that time. The studio became my teacher and the experience made me a lot more comfortable as an artist. Colour has always been an intricate aspect of your street art, often containing hundreds of shades. What is the significance of such a nuanced palette and how did it evolve? Did you always have an eye for colour? Well, I’m not sure whether I always had an eye for colour, or if I just trained myself to see it. It’s become a bit of an obsession with me though. My time in the studio experimenting with different techniques has definitely had an impact on the way I paint my murals and has added to the excessiveness of my colour palette. 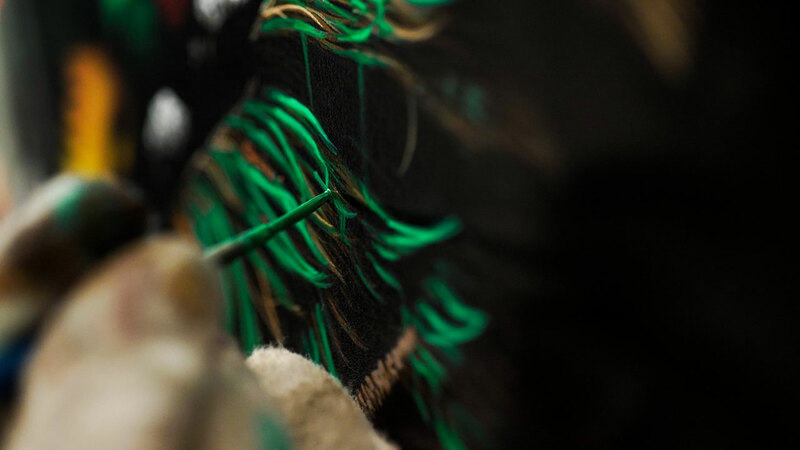 In some of my canvas paintings I counted over a 1000 shades of colour, to create depth in the hair or skin. I decided to bring a scaled down version of this method to my murals to see what would happen and it seems to produce something quite different and unique. I still use spray paint but because there aren’t enough colours I decant the paint and mix them by eye to get the precise shades I need; a process I’ll probably evolve and adapt and see where it takes me. Sonny, KAARIA, original hand-painted canvas, spray paint and acrylics on handmade wooden boxes, 120 x 100cm. 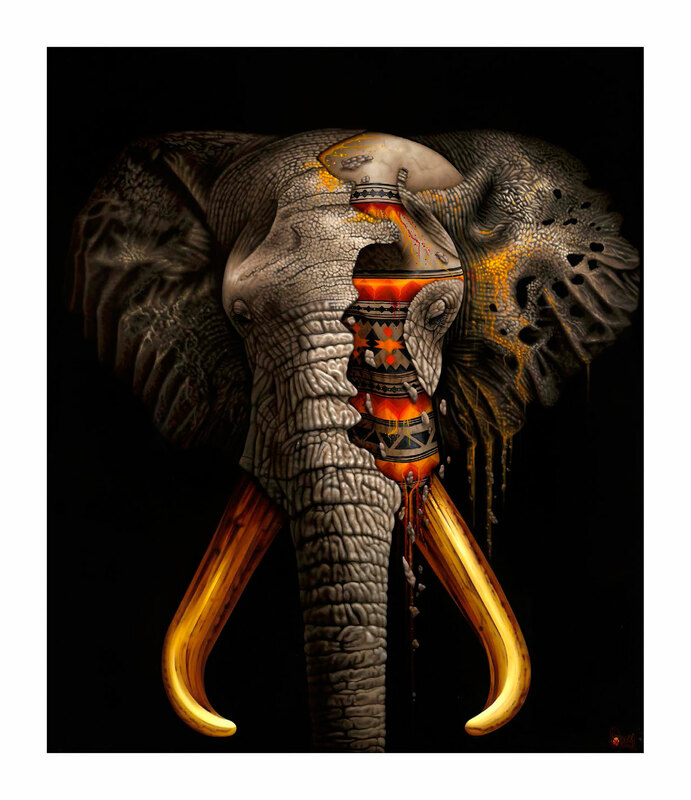 The tribal colors and golden elements of the canvases of TO THE BONE acquire a powerful presence as they emerge from the pitch-black background. Is this juxtaposition a purely aesthetic choice or is there a conceptual significance in the predominance of black? The animals are coming out from the shadows with one directional light on their faces, symbolic of how the paintings are shining a light on the issues. 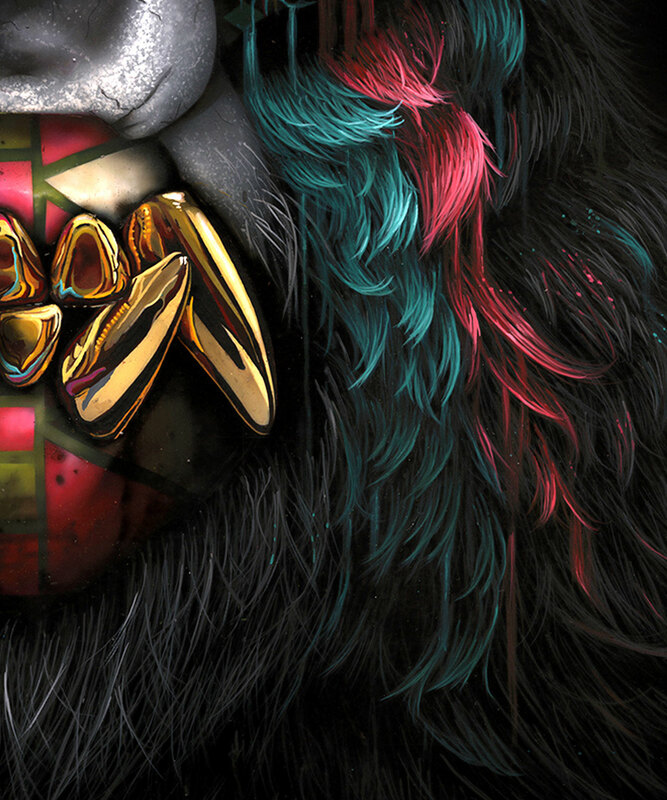 Aesthetically, it was also done intentionally, as I wanted to make the animals really pop in a unique sort of digital looking way with super strong blacks, bright colours and high contrast. I wanted to create something that people take a second look at, something that they haven’t seen before, even if they can’t quite put their finger on it. When people see the paintings online, a lot of them think that it’s digital work and even in person people often get right up close to see if they’re printed or painted. I spent over a month searching for the strongest black possible, even going as far as spending time in paint labs working out how far I could push different black paints, while still being compatible with other paints and still being feasible to brush and spray. After settling on my black, it was another process to find paint that could get enough colour shades to go all the way to the shadows of the new black without losing vibrancy - regular artist paints weren’t cutting it. After a lot of trial and error, I found a great formula that worked and rolled with it. It may not have all been necessary, but who knows, I guess I’ll see at the exhibition. Sonny, LOHAN, original hand-painted canvas, spray paint and acrylics on handmade wooden boxes, 120 x 100cm. 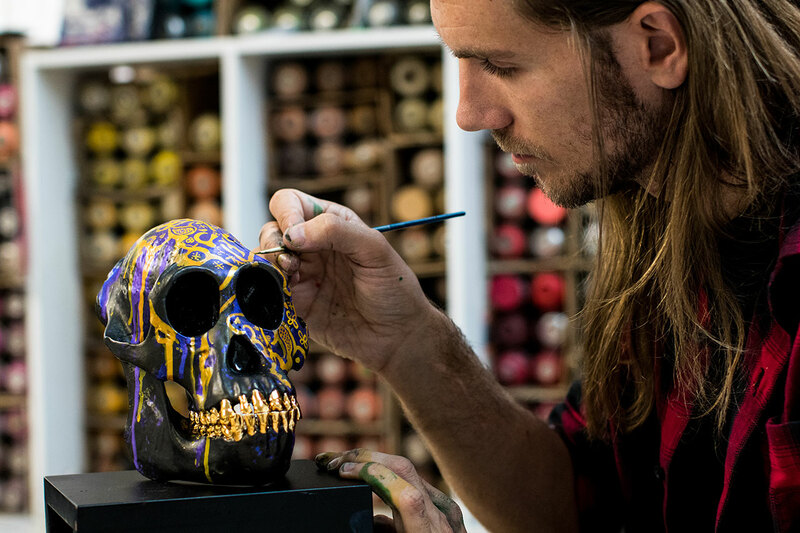 How did the idea to accompany the canvases with hand-painted skull replicas come about? As a kid, I was obsessed with dinosaurs and would often drag my parents to the museum so I could see the dinosaur skeletons. Looking at the bones, it always blew my mind to think about how these creatures once actually roamed the earth and I remember wishing that I could have seen them in the flesh. A few years ago, seeing a pile of animal skulls on a hunting farm, this memory came back to me as it dawned on me that those animals recently walked the area. 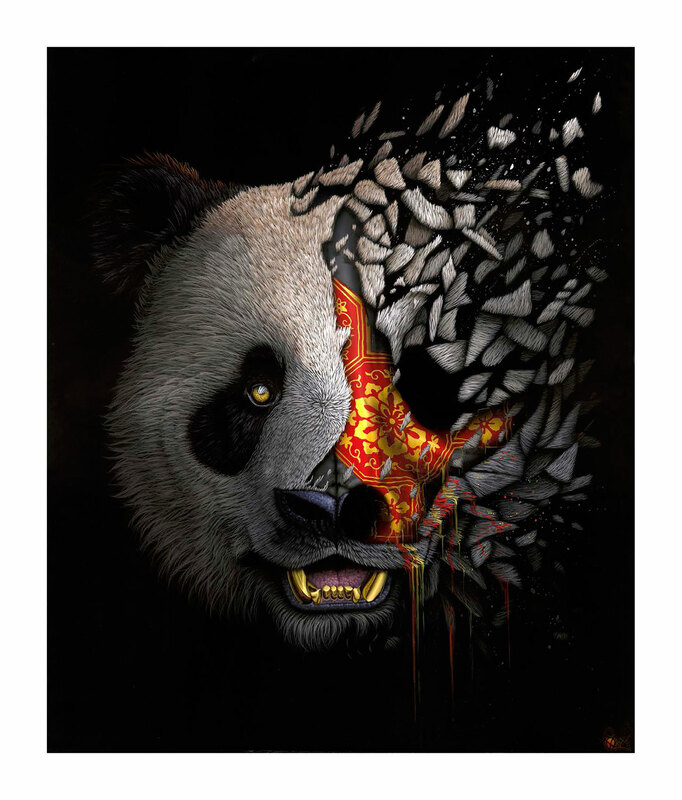 This sparked the whole imagery behind “To The Bone” and the idea to incorporate the animal skulls into the exhibition work and to use them as a symbol for what the future may hold. 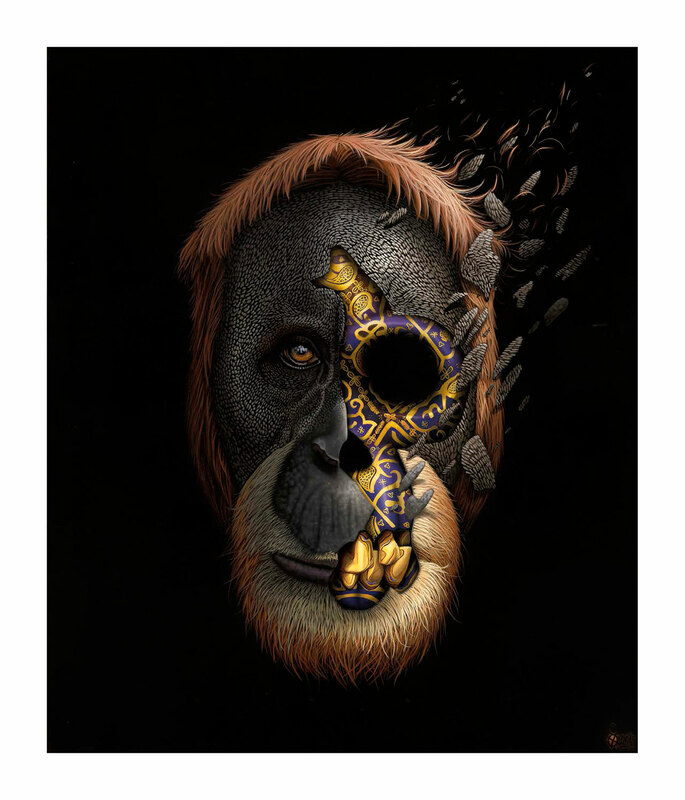 Perhaps the only way future generations will be able to connect with these great creatures is by looking at their skulls on display in a museum, wishing that they had the chance to see them in real life. 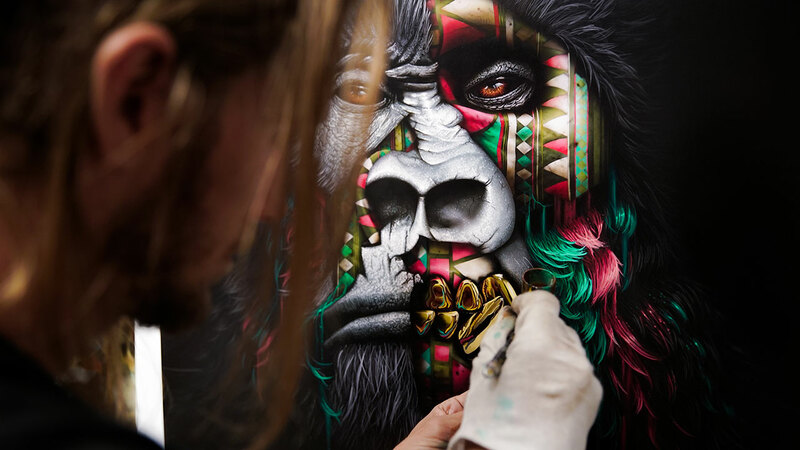 The murals that accompany this project can be found in several cities across the globe. With what criteria did you choose them and how did you select the exact locations? 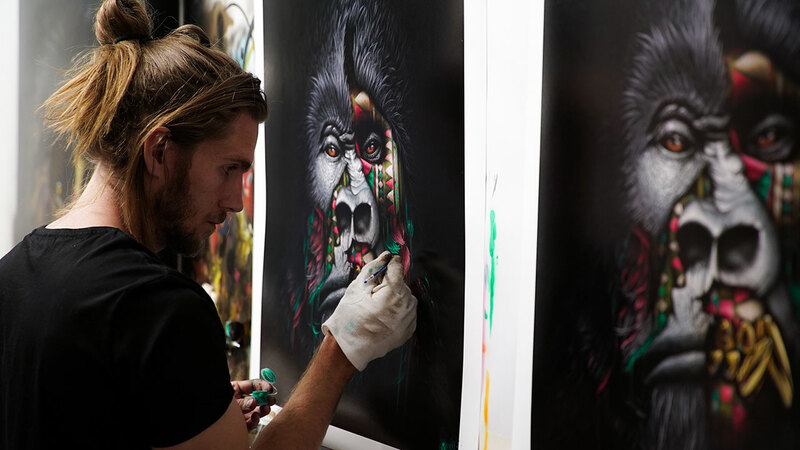 Originally, I was approached to do a documentary series around the project so we put it into development and created a global plan to visit as many countries as we could, based on the animals from the canvas series. Sadly, it didn't work out so we went at it ourselves with a general plan and let it develop naturally. The various locations just naturally worked out and the tour eventually ended up looking very similar to the original plan. Finally, why did you choose SONNY as a moniker? Sonny, MANIPI, original hand-painted canvas, spray paint and acrylics on handmade wooden boxes, 120 x 100cm. Sonny, MUDIWA, original hand-painted canvas, spray paint and acrylics on handmade wooden boxes, 120 x 100cm.